Ornate furnishings with contemporary gold art in this soft Master Bedroom. Gold, grey blue, cream and black on white shag rug. White, gold and almost black are used in this very large, traditional remodel of an original Landry Group Home, filled with contemporary furniture, modern art and decor. 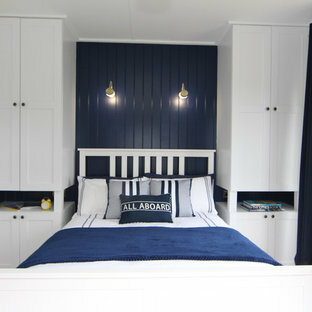 White painted moldings on walls and ceilings, combined with black stained wide plank wood flooring. Very grand spaces, including living room, family room, dining room and music room feature hand knotted rugs in modern light grey, gold and black free form styles. All large rooms, including the master suite, feature white painted fireplace surrounds in carved moldings. 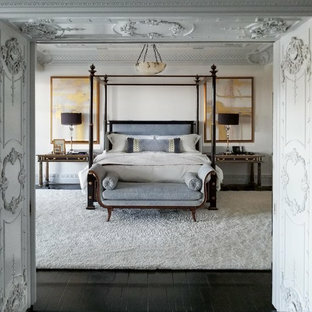 Music room is stunning in black venetian plaster and carved white details on the ceiling with burgandy velvet upholstered chairs and a burgandy accented Baccarat Crystal chandelier. All lighting throughout the home, including the stairwell and extra large dining room hold Baccarat lighting fixtures. Master suite is composed of his and her baths, a sitting room divided from the master bedroom by beautiful carved white doors. Guest house shows arched white french doors, ornate gold mirror, and carved crown moldings. 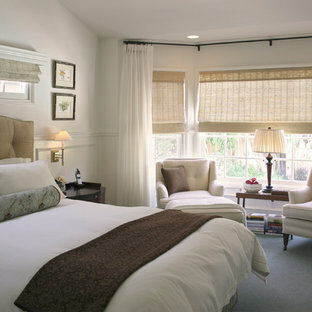 All the spaces are comfortable and cozy with warm, soft textures throughout. Project Location: Lake Sherwood, Westlake, California. Project designed by Maraya Interior Design. From their beautiful resort town of Ojai, they serve clients in Montecito, Hope Ranch, Malibu and Calabasas, across the tri-county area of Santa Barbara, Ventura and Los Angeles, south to Hidden Hills. Perched on a knoll atop a lakeside peninsula, this transitional home combines English manor-inspired details with more contemporary design elements. The exterior is constructed from Doggett Mountain stone and wavy edge siding topped with a slate roof. The front porch with limestone surround leads to quietly luxurious interiors featuring plaster walls and white oak floors, and highlighted by limestone accents and hand-wrought iron lighting.